The 2000 Kellerman Lecture for New South Wales and the Australian Capital Territory, published in ANZMRC Proceedings 2000. This paper introduces a series of two rituals, Grade d’App Maçon de pratique and Grade de Comp Maçon de pratique, contained in an eighteenth-century French manuscript held in the National Library of Australia (NLA). The Clifford collection  within the NLA holds a French manuscript dating from the late eighteenth century which contains twenty Masonic rituals and allied material. Some of these rituals have been the subject of papers published by both the Victorian and New South Wales Lodges of Research  and also of lectures delivered at Lodges and Chapters in both jurisdictions. The background to the manuscript can be found in those papers. It is necessary to note, however, that the Canberra volume is the first of a set of six, the other five being housed in the Kloss Collection in the Library of the Grand East of the Netherlands, in The Hague. Since these papers were written, a further internal reference has been discovered which provides an even tighter range of dates of writing than those already considered. In the ‘Table Lodge’ (the fourth section of the NLA volume) the second toast is to the French Royal Family. This mention would date the collection to 1789, or possibly 1792 at the latest. Within the text of the ritual of the ‘Petit Chevalier de l’aigle noir’, (Little Knight of the Black Eagle), (Tome VI, number 4 in the Kloss Collection) a book entitled Le Diadéme des Sages is mentioned as a reference within the text. This book was published in 1782. So it would appear that the collection was compiled or copied after the publication of that book—somewhere between 1782 and 1789. Following the three Craft degrees, together with the workings of a ‘table Lodge’, the collection contains four sections relating to a suite of degrees known as the ‘Maçons de pratique’ or ‘practical masons’; an introductory short history, or ‘etimologie’, of the degrees; two rituals, those of the Apprentice and Companion; and the statutes or regulations of a lodge working those degrees. This paper is concerned only with the rituals and the ‘etimologie’. MASON, PRACTICAL. – 1. An operative Mason is by the French called maçon de pratique. It would appear that these rituals were stylised from the operative manner of working, but have been considerably revised to incorporate significant speculative elements. The translation has been modified to reflect more closely present practice: for example, First Surveillant is converted to Senior Warden. In some cases the punctuation has been adjusted to enable a better reading of the text. These alterations have in no way changed the basic thrust of the text. Minor editorial comments are in brackets, in italics. Italicised text not so enclosed has been used to denote the rubric of the degrees, in line with standard ritual production. Although inserted directly after the Craft degrees in the volume, it should not be assumed that these degrees are linked in any way to them, as the collection is not generally separated into rites or series of degrees. 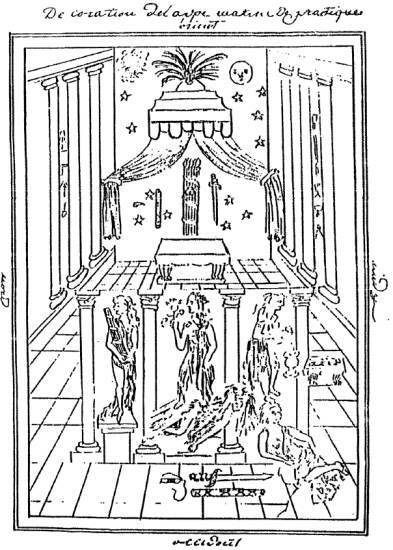 For each degree there is an illustration of the lodge room as prepared for the ceremony and usually an illustration of the tableau or tracing board of the degree. 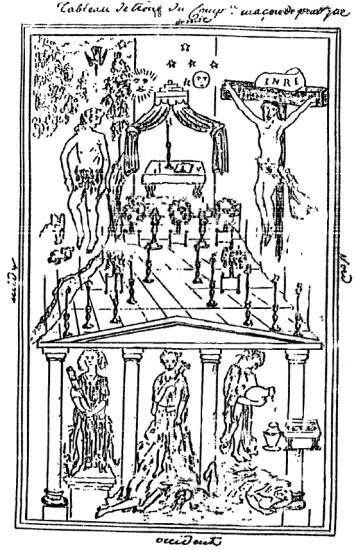 The Compagnon degree in this series also has an illustration of a second tableau. These illustrations are reproduced at Appendix 1 as Figures 1–5. 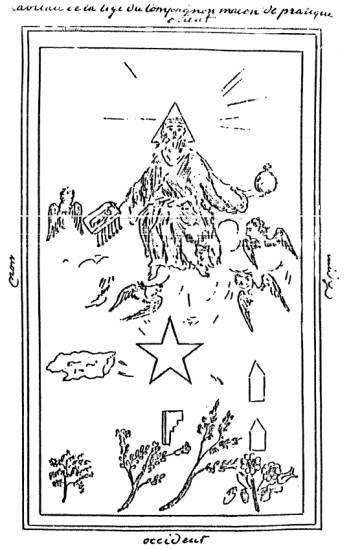 The lodge no longer represents the four cardinal points; the East is named Justice, the South Strength, the West Temperance and the North Prudence. On the South column are the drawing-board, rule, pincers, hammer and compasses. On that in the North the plumbrule, square, level and trowel. The throne should be raised upon steps (of any number) and the façade depicts a porch dedicated to Concord and Amity. The two sides are embellished with Tuscan pillars and between the pillars are three figures. That on the right of the Master represents Concord, holding a lictor’s fasces with two olive branches, symbol of the peace and gentleness which should be enjoyed in a well composed lodge. That in the middle holds a pomegranate in her right hand, and beneath her feet is placed Discord, who is of a sallow colour, with hair of serpents and a thin body, emaciated in emulation of that what she incessantly afflicts upon humanity. That at the left represents Amity or Unity, pouring liquid from one vase into another. At her side is a small altar covered with a cloth of the same colour as the curtains, and upon this are a sceptre and a trowel. At her feet is a figure representing Slander, having long ears and a mask. Behind the throne is a trophy in the centre of which is a monogram in flowers consisting of the initial letters of Wisdom, Strength and Beauty [SFB—Sagesse, Force, Beauté]. At one side is a sword in saltire [shown upright in the illustration] and at the other a sceptre with a radiant eye. All this is upon a dark sky spread with silver stars. To the right of the throne is a rising sun and on the left a full moon, and both are positioned and arranged in a manner so that they can be rendered transparent if desired. As regards the illumination of the lodge, the more it is lit the better. 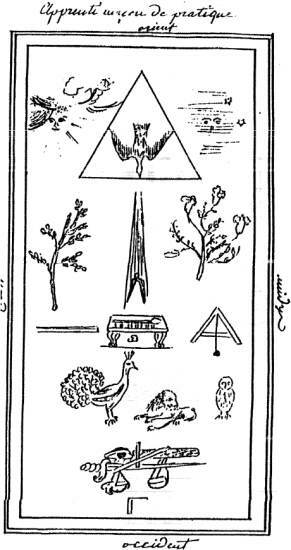 The board of the lodge is a rectangle of which the Eastern part represents, as previously stated, Justice, the South Strength, the West Temperance and the North Prudence. The Grand Master and all the brethren are dressed in clothing of any colour, the Grand Master only has a hat on his head. This hat is of the style worn by Louis XIV, with a plume, and he wears a broad blue moiré collar falling to a point at the level of his stomach, a pair of gloves and an apron of sky blue taffeta, all edged around with gold and trimmed with abundant gold lace. At the end of his collar hangs a jewel which represents a lictor’s fasces and two olive branches; this jewel should be of gold. The officers similarly wear a broad blue moiré collar, also ending in a point at the stomach, at the end of which hangs the jewel being a knight’s cross of gold or gilded metal. In the middle shall be engraved two doves in silver and on each arm of this cross is a small pomegranate. This cross is worn by the brethren on the third buttonhole of their coats, attached to a small rosette of sky blue edged with gold, and at the end of a broad ribbon of the same colour, worn as a sash from right to left, and also edged with gold. In addition, each wears a pair of gloves and an apron of sky blue, also edged around with gold. All thus prepared, and the candidate in the chamber of preparation, the Worshipful Master opens the lodge as follows. Q. What time is it, my brother? A. Worshipful Master, it is one o’clock, the time when we may admit any qualified candidate to contract with us and strengthen us. Upon that answer the Worshipful Master says to the two Wardens: My brethren, announce to your columns that I am going to open this lodge of Apprentice Practical Masons and do so with all of the respect and decency due to our august mysteries. After this has been announced to the two columns as ordered, the Worshipful Master says to the whole assembly: My brethren, this lodge of Apprentice Practical Masons is opened. Let us do our duty. All give the sign; then nine claps, by three times three, as before with their hands, saying three times: “Vivat”. After this, each resumes his seat in silence and they then proceed to the initiation in the manner as follows. The lodge being opened, Brother Expert, or his assistant, by order of the Worshipful Master, leaves to see the candidate in the chamber of preparation. There he deprives him of his sword, his hat, his cane, the buckles of his shoes, his garters and his collar and deposits them with a serving brother, who takes care to take them immediately into the lodge. During this time Brother Expert asks the candidate whether it still is his desire to be received as a freemason of the Temple of Amity, under the protection of the wise King Solomon. Upon his answer he says to him: Allow me to blindfold you, after which you will be introduced. Q. What do you desire, sir? A. [prompted by Expert] I am a brother, unknown amongst men, who desires to add to the number in this temple. Q. Sir, tell me what you are called, what is your surname, what is your age, what is your profession and finally from whence do you originate? A. I am called . . . , my surname is . . ., I am . . . years old, my profession is . . ., I come from . . .
After that response is given the Junior Warden closes the door, returns to his place and reports the candidate’s replies to the Worshipful Master. On receiving that report the Worshipful Master says to the entire assembly: Brethren, do you consent that the candidate who is presented to join us be received? Each giving his consent in the usual form known among masons, the Worshipful Master orders the Junior Warden to introduce him. This brother immediately returns to the door, opens it and takes the candidate from the hands of Brother Expert and introduces him in the West between the Senior Warden and himself; then he is seated on a chair or seat placed in that spot. Everyone observing the most profound silence, the Worshipful Master says to the candidate: Sir, you are in a place where your own credulity has led you. What thoughts have you of yourself? Brother Expert dictates the answers to him. Very Respectable Master, I think that the Creator formed me from the clay of the earth. I was created in His image. He animated me with a divine breath and distinguished me from other creatures, giving me absolute power over them. It is therefore to submit myself to the wishes of the Eternal that I come to search among you for refuge, which will give me a shelter against the storms of this world, and I hope that it will be in the bosom of your temple, where I come to present myself, that the virtues which attend on you will renew me, should you deem me worthy. At this answer the Master says to him: Sir, by the obligations of nature we cannot refuse your admission amongst us. But beforehand, my brother, tell us please what you think of those who are the scourge of our temples, to whom we have opened our hearts, whom we have received into our breast and, finally, upon whom daily fall our blessings. The candidate tells what he thinks of them. Then the Master continues by saying: My brother, there are ungodly brethren who unceasingly tear and break the shield which has always been used in their defence. This is the way of the ungrateful, who are always with us and who will lay the same snare for you as they do for us. I will speak to you more openly and make known to you the excess of their ingratitude. When Moses was leading the people of Israel, did we not see that suffering thirst made them want to rebel against this holy person who, by the omnipotence of God, struck the rock and made water come forth. Moreover, did we not see that these same rebels profane the law of God, which they had received from the hands of Moses, when they adored the idol of the golden calf? Did we not see our famous Master Hiram suffer death by those who daily received from him the reward due to their merits? In a later period, there was the prophet Zachariah who incessantly addressed his prayers and sacrifices to the Eternal for the whole people. Did we not see him being massacred on the steps of the temple by those for whom he prayed? At the time of the wars in Palestine, caused by the need to establish freedom of religion, did we not see that unforgettable Godfrey of Bouillon release their fetters and they turned their weapons against him and, including up to the present, that they reside with the brethren, bringing discord with them? Such, my brother, are the deeds which I relate to you, which are known to the whole universe, and there have been numerous others which are a disgrace to humanity, and for which we retain the name ‘Rational Creatures’. I will keep silent about them. Do you still persist, my brother, in your noble feelings which led your path here, and do you still desire to be numbered among us? Upon this answer the Master gives three knocks with his mallet on the altar, which serve as a signal to the Junior Warden to restore the candidate to light. He does so and then the Master says to him: Brother Junior Warden, let the brother make one perambulation, by having him pass from the West to the North and then to the South and then to the East. This brother has him rise and make a single perambulation from Temperance to Prudence, from Prudence to Strength and from there to Justice, where, arriving at the base of the altar, the Master, who until this moment was seated in a chair placed at the foot of the throne, mounts the throne and counsels the candidate always to be faithful to God, to the King and to the whole order in general. He promises this and, to confirm his promise, the Junior Warden and Brother Expert have him climb the steps of virtue and kneel at the foot of the altar. There, on his knees, in front of the whole assembly, he pronounces aloud the following obligation. I swear before the Universe, the work of the Eternal and source of light, and in this Temple where God hears me, to always submit to His Holy Will, to serve my Prince with the greatest fidelity, to preserve our laws, to love and cherish my brethren, and to oblige them in all that depends upon me. May a portion of the celestial fire set me alight and enlighten me. May God and His Holy Spirit be my aid. Amen. After this obligation is taken, the Master has him rise and pass to his right side, where he invests him, on the third buttonhole of his clothing, with the ribbon and jewel of the order, saying: By the authority I have received, and by the unanimous consent of this august and worshipful assembly, I receive you as an Apprentice Practical Mason. He then invests him with the gloves and apron. He then embraces him in the usual manner. When this embrace is given, Brother Expert, who has been at his side throughout, and the Junior Warden immediately give him the sign, words and token as follows. The sign is given by bringing the index and middle finger of the left hand to the mouth to depict the silence or secret to be maintained concerning our august mysteries. The token is made by giving the right hand and mutually resting the left hand flat on the heart. After Brother Expert has given the sign, words and token to the candidate he embraces him and tells him to pass them only to the Junior Warden, which is done. The Junior Warden embraces him also and seats him among the brethren. Then the Orator gives to the new initiate an informative address on the degree. Masonry had its origin many centuries ago, all for the better understanding of a work consecrated to God. At that time they would only admit those qualified individuals in whom they found the qualities required to carry out the wishes of the worthy, wise and virtuous Master who was Solomon. This wise King, not wishing to commit an injustice by paying the Apprentice like the Fellowcraft, and the Fellowcraft like the Master, believed (in fairness) that he must divide masonry into three classes or degrees which he named Apprentice, Fellowcraft, and Master, and assigned to each of the three classes or degrees a sign, a sacred word, a pass word, and a grip, so that individuals received only the recompense due to them; and according to the ancient scriptures only these three degrees were known at that time. We see that from that wise King onwards, until the restoration of the worship of God after the captivity of the Jews, Masonry prospered in fullest possible bloom; evidence the holy places conquered by Godfrey of Bouillon, under the control and command of whom the Knight Masons and Knights of the Temple marched, not to mention the continuing and perpetual progress made every day by these illustrious and noble Knights whose success was the envy of France which overcame them and carried off all of their possessions, accusing them of the most appalling foul deeds, without any proof, and suppressed them supposedly completely, but as they didn't destroy the source of the respectable Order it did not cease, and will not cease to exist as long as it is not overwhelmed by the chaos of the elements. It is said that these brave Knights, after the conquest of the Holy Land under their worthy and very worshipful Grand Master Godfrey of Bouillon, were dispersed all over the habitable earth where, by their edifying examples, they were fabulously enriched by the number of initiates which they accepted and didn't cease accepting every day and who sustained, and will make it always a duty of sustaining by their edifying examples, the Order in its first splendour. The Knights of the Sun withdrew to Africa, those of the Crusade returned to France; the latter, as has been said, suffered most dreadfully, and those of the Temple of Jerusalem went to Malta and into the capital of Gaul, as did the Knight Freemasons. After that short description, I must not neglect to advise you that this respectable Order has not stopped being the victim of the envy, scandal, slander and, above all, ignorance of that despicable gang. I must not forget to point out to you that we have seen, now, and will always see kings, princes, and lastly the greatest of monarchies made glorious by treating with the beloved name of Brother the simplest artisans if ever they are gifted with the appropriate qualities which make an honest man, and this done in order to be loved by the brethren. As you have seen, those who fail this respectable Order are punished with the greatest severity, witness those who fail the Order by going out to profane places ornamented with the emblems which support merit in a respectable Temple properly managed by a Master worthy of governing. As I have said, those who fail in their responsibilities are excluded from their Masonic activities forever. On the other hand others have been seen, at a masonic banquet, to surrender to the sensuality of their taste and, having finally lost the use of reason, to leave drunk also ornamented with their ribbons and regalia, and deliver themselves to dishonour and the scorn of the citizens; these are punished and cited in all the temples so that they are never again to be approached; there those who would spread misunderstanding in the feeble-minded and who, more often than not, make a place of peace and tranquillity a place of discord and even of the most acrimonious hatred. I myself have seen some who, having at carnival time, in disgraceful clothing, dared to show the signs and words, were punished and locked up in the most awful jails in order to be completely expelled from human society, and were deprived of all dealings, even with individuals lacking faith in the man whose name is beloved and is respected throughout the entire world. How much unhappiness also have we when one who dwells amongst us in name only, having none of the appropriate qualities to be a man worthy of us. What gives rise to that dreadful confusion, it is the very great ease by which he has been admitted amongst us here, and as long as we do not test the morals of those who are presented, the same confusion will always take place; therefore, to prevent similar misfortunes, we should remember to follow the way indicated by Solomon. Remember the first degree where we learnt that Solomon caused the wood to be cut and the stones to be carved in the quarries and forests of Mount Lebanon so that in the Temple no unintended noise would be caused by tools composed of metal, which Solomon considered as a symbol of vice. This reason for this enigma is very easy to explain and by which we learn that one cannot be admitted into our august society unless he has been deprived of all metals, that is to say of all vices generally whatsoever. In following exactly all these things we will have the pleasing satisfaction of seeing good relationships reign among us, also of seeing our lodges well formed, our best labours well attended, and finally we would see brotherly friendship reign again without politics; may heaven grant, my dearly beloved brethren, that we could enjoy forever this gentle satisfaction. 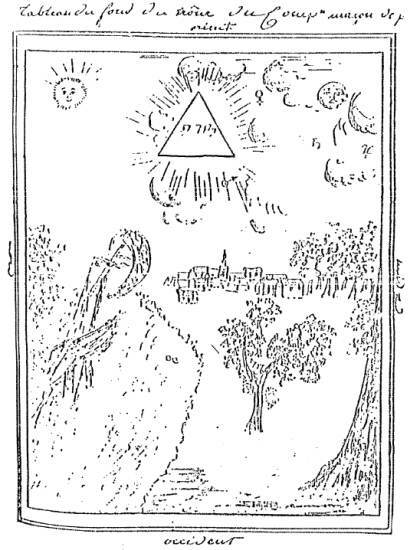 Without discoursing further, I am content to have given you this short extract drawn from the writings of a true and faithful mason who visited every temple of the four parts of the world; and who, for this reason, has been able to know every ridicule, and invite you to practise thus what I have outlined. After this, the Master proceeds to the examination as follows. Q. Brother Senior Warden, what do the four parts of the world signify? A. Firstly, Temperance signifies that one cannot present himself nor live among us, if he has not cast aside all depraved behaviour; secondly Strength, that one should adopt a spiritual strength to resist all the snares which present themselves to us; thirdly Prudence, that one must not judge anything but by knowing the cause and to execute nothing except after mature reflection; lastly Justice, which is the symbol and the foundation of all work. Q. What do the radiant triangle at the top of the board and the Holy Spirit in the centre signify? A. The triangle represents the grandeur of God, the Holy Spirit, the divine Spirit enclosed in Himself and the spiritual breath which animates us and ignites our love. Q. What does the moon spread with stars in a dark heaven signify? A. This is to remind us that Man in the course of his days, in spite of the virtues accompanying him, is but nothing in comparison to Him and of the obscurity that he has no knowledge of the true God. Q. What does the rising sun signify? A. It represents the birth of the Virtuous Man, who one day has to enlighten the vast universe by his advice. Q. What does the altar in the centre signify? A. This altar signifies the sacred deposit of the virtues one obliges himself to follow when taking his obligation. Q. What do the beasts lying beneath it signify? A. They show us that before entering into such a fair quarry, one has to tread down all vices. Q. What do the two branches of pomegranate and olive tell us? A. The pomegranate, the harmony that should reign among us and the olive, the peace being felt here. Q. What do the sceptre, the eye, the sword and the balance signify? A. The sceptre signifies that one can only act justly after having seen matters with the eyes of experience and uncertain what is fragile, the sword is the chastisement due to crime and infamy, the balances that one should never favour anybody and that one always has to be the same and equal under all circumstances. Q. What do the masonic tools signify? A. The compasses, the measures which should be taken before anything is carried out; the square, that there should be within our personality set landmarks by which we assess everyone; the level, the rectitude of the actions of our life however difficult to conduct; and the rule, the scale of everything according to its extent. Q. My brother, I am fully satisfied with your work. What is the hour? A. Very Worshipful Master, it is midnight, when we are to cease our labours. My brethren, announce to your column that I am now closing this lodge of Apprentice Practical Masons and that we are going to do our duty by three times three. After this has been announced to the two columns as ordered, the Worshipful Master says to the whole assembly: My brethren, this lodge of Apprentice Practical Masons is closed. Let us do our duty. All together they give the sign, then nine claps, by three times three, as before with their hands, saying three times: ‘Vivat’. After this they embrace each other and the alms-box for the poor is circulated. Then each retires, after the usual banquet, in peace. This lodge no longer represents the four cardinal points. The East is called, as has been mentioned in the Apprentice degree, Justice, the South, Strength, the West, Temperance and the North, Prudence. To the right of the throne will be a sun in a dawn-coloured heaven. At the left is the moon in an azure heaven spread with golden stars. All the hangings are to be trimmed with golden lace and fringes. The tapestry in the North will represent the first Man [Adam], in the earthly Paradise, being enlivened by the Divine Breath and all other beings coming to life at his side. That in the South represents the Messiah fulfilling His sacrifice on the tree of the cross, for our redemption. The sides and the front of the throne are trimmed with [Versailles] boxes with artificial or natural flowers, of different species if possible, placed on the floor, and, between the boxes at the foot of the throne, are two large gilded candlesticks, each having a large lighted candle. The remainder of the lodge will be lit by a large number of candles, placed around the lodge as desired, in candelabra attached to the walls, or in chandeliers attached to the ceiling. 7. finally, at the foot of the Tracing Board, olive, pomegranate, myrtle and rose branches. The Master, who has the title of All-Puissant, is dressed (as are all brethren who compose this august assembly) in a tunic of a sky blue colour falling to his knees, the sleeves narrowing to the wrists. Over this they have an apron of white leather folded and edged with a sky blue colour. On the centre of the apron one may, if desired, have embroidered, with a sky blue colour, the same pattern as depicted on the board. Their gloves are made of sky blue taffeta, trimmed all around with gold, as are their tunics and moiré ribbons, which are also of a sky blue colour. These ribbons are worn by the Master and the officers as a collar with the point falling on the level of the stomach and by the brethren as a sash from left to right. At the end of each ribbon, attached to a small red rosette, is the jewel, which represents a broached thurnel. This jewel must be made of gold, or at least of gilded metal. Their shoes are made of sky blue coloured material, the tops of which are embroidered in gold and adorned with a rosette of burgundy red ribbon, the ends of which are trimmed with golden lace or fringe, similar to the apron, the gloves and the collar of the Master, who must have a golden belt. He has a hat of the style of Louis XIV on his head and his tunic is adorned with stars embroidered in gold. The jewel hanging from the end of the collar of the Master is a radiant triangle enclosing a Blazing Star with five rays, in the centre of which is the letter G. This star is made of precious stones, the G of gold and the triangle should also be of gold, or at least of gilded metal. Everything thus prepared, the lodge is opened as follows. Q. Worshipful Senior Warden, what is the hour? A. It has sounded noon, Master. Upon this answer the Master says to the two Wardens: My brethren, announce to your columns that I will open this lodge of Fellowcraft Practical Masons and that each is to behave with all the respect and decency due to these august mysteries. My brethren, this lodge of Fellowcraft Practical Masons is open. Let us do our duty. The Wardens announce in turn the same thing and all give the sign, then six quick claps with their hands as before, saying three times: ‘Vivat’. After this each resumes his seat in silence and then they proceed to the initiation in the manner as follows. The lodge being opened, Brother Expert or his assistant leaves to see the candidate in the chamber of preparation, where he poses various questions about the preceding degree. Then, after having him give the sign, words and token, he has him take off his sword, his hat, his shoes and his outer clothing and gives all this to a brother, who takes care to take them immediately into the lodge. During this time Brother Conductor dresses the candidate in a tunic, similar to that described before. He then has him put on a pair of shoes, like those described. After this he has him put on an apron of white leather and on his hands a pair of gloves, also of white leather. He puts a real rough ashlar into his hands and in this state he conducts him to the door of the lodge where he twice gives a quick knock, which are answered from within by two other knocks. Then after the usual ceremonies of announcing and opening, the Junior Warden, upon the order of the Master, opens the door and receives the candidate from the hands of Brother Expert. He is then placed in the West at the foot of the Tracing Board by the three Apprentice steps, still holding the rough ashlar. This is proof of his accession to Apprenticeship. Q. My brother, I would like to know who instructed you during your Apprenticeship, regarding the fortifying of the Temple? A. The respectable workmen of the Temple were pleased, after my admission, to comply with your wishes and showed me the cutting of stones, the composition of a strong cement, the manner of drawing lines, perpendiculars, diagonals, horizontals, profiles, the manner of drawing plans, and lastly the study of geometric and other figures according to their precepts. I bring to you the rough ashlar and request that you pass me to the perfect ashlar, should you deem me worthy and all the brethren consent. Upon this answer the Master says to the whole assembly: My brethren, do you consent that this brother be admitted to our august mysteries? Q. My brother, what did you see during the course of your perambulations? A. Very happy men, enjoying great felicity. Moreover, I saw the abundant creativity of the Temple and the composition of this building. Q. Did you not see anything else? A. I also observed things my judgement cannot recognise and so it is to the great erudition which you possess that I leave my enlightenment. Upon this answer the Master says to him: My brother, before going into detail, approach along the way of Justice to take your obligation. Brother Expert and the Junior Warden immediately have him advance by six triangular successive steps to the foot of the altar, and have him mount the steps. After he has mounted the steps of the altar, the Junior Warden has him kneel and place his right hand on the Holy Gospel. In that posture the Master has him take his obligation as follows. Under the eyes of the Great and Supreme Architect of the Universe and under the auspices of the Virtues which support and direct our work, I swear before this vast universe, the work of God, Creator of all things, and in the presence of this august and very worshipful assembly, never to break my promise of fidelity which I give this day. If I fail in my promise, may the revenging sword, which drove the first man from earthly Paradise, strike me dead at that very moment. May God and His Holy Gospel preserve me from such a misfortune and be my aid. So mote it be. When the candidate has taken his obligation, Brother Orator gives an instructive address on the importance of this degree. When this address is finished the Master has him rise and pass to his right side where he decorates him with the gloves and apron described before. Then he orders the Junior Warden to have him descend the steps of the altar and to give him the sign, words and token of this degree. After executing this order, the candidate stands at the base of the steps of the altar. The Junior Warden gives him the sign, words and token as follows. The sign is given by holding the closed fist on the breast as if one were holding a sword and wanting to pierce the heart. The sacred and pass words are Latin words which contain in them the mystical sense concerning the terrestrial Paradise. They are Iam flores pubescunt, which mean: the flowers commence to bloom. The token is given by partially interlacing the fingers of the left hand. After the Junior Warden has given to the candidate the sign, words and token, the Master tells him to make himself known as a Fellowcraft Practical Mason to the whole assembly, which is done. Back in the West, the Junior Warden gives him the kiss of peace in the usual manner known among Masons. After this the Master orders the Junior Warden to have the candidate approach by six triangular successive steps, as before, up to the foot of the altar, in order to give him the reward due to his work. My very dear Brother, by the authority I have received and the unanimous consent of this august assembly, I receive you as a Fellowcraft Practical Mason so that you can enjoy the honours and privileges, dignities and prerogatives attached to this sublime degree. Permit me to give you, in this capacity, the first kiss of peace. He immediately kisses him in the usual manner and afterwards has him take a seat among the brethren to witness the other initiations, should there be any. These proceed in the same manner as before and afterwards the Master commences the examination as follows. Q. Worshipful Brother Junior Warden, are you a Fellowcraft Practical Mason? A. Worshipful Master, I am. Q. How have you been announced at the door of the lodge? A. By two quick and equal knocks. Q. How have you been introduced? A. By the three steps of an Apprentice, with free sight and holding a rough ashlar in my hands. Q. Why did you receive a rough ashlar in your hands? A. To prove my accession to the Apprentice degree. Q. What did you do with this stone? A. I deposited it at the foot of the board and then the Master asked me the next questions. Q. What were you taught in the degree of Apprentice regarding the fortifying of this temple? A. Master, the respectable workmen, after my reception, were pleased to comply with your wishes and showed me the cutting of stones and the manner of making a strong cement. Q. What did they then teach you? A. To draw vertical lines, diagonals, horizontals and, lastly, profiles. Q. Did they not teach you any other things? A. They taught me then to draw plans and to study geometric and other figures according to their precepts. Q. Having satisfactorily answered their questions, what did you ask for as a reward for the progress you made during your apprenticeship in this sublime order? A. I returned the rough ashlar which was conferred in a former degree and asked that I might pass to the perfect ashlar, if I was thought worthy; and if it was the pleasure of all the brethren who compose this august assembly. Q. What did the Master do at that request? A. He immediately asked for the consent of the whole assembly in the usual form and then he said to me that after all the progress he saw made by me it would be a great pleasure to him and at the same time a duty to grant the advantage I demanded from him with the hope he had that one day I would add to the edification of his temple. Q. What did he then require of you? A. He made me perambulate six times around the interior of the temple to consider the interior beauties of it. Q. What did you observe during the course of your perambulations? A. Humans twice-happy enjoying a great felicity. Q. Did you not observe any other thing? A. I observed the abundant creativity of this temple and of the composition of the building. Q. Did you not see anything more? A. I also saw things my judgement could not discern. Q. When your perambulations were finished, what did the Master then do? A. He ordered that I had to approach by six successive triangular steps up to the foot of the altar, where he had me take my obligation in the usual form. Q. When you had taken your obligation, what happened then? A. The Brother Orator delivered an instructive address to me on the dignity of this degree; then the Master had me rise and pass to his right side, where he decorated me with the gloves and apron of the order. Q. What did he then command? A. He ordered the Junior Warden to have me descend the steps of the altar and there to give me the sign, words and token of this degree, so that I could make myself known as a Fellowcraft Practical Mason. Q. These sign, words and token given, what did the Junior Warden require from you? A. To go and make myself known to the whole assembly as a Fellowcraft Practical Mason, which I did. Q. What did the Master then order? A. That I had to advance by triangular steps to the altar to give me the reward due to my labours. Q. What was that reward? A. He decorated me with the collar and jewel of the order. Then he received me as a Fellowcraft Practical Mason with the unanimous consent of the whole assembly. Q. What did he do afterwards? A. He had me take a seat among the brethren and then proceeded to other initiations in the manner as seen before. Q. How do you make yourself known as a Fellowcraft Practical Mason? A. By my sign, words and token. Q. Give them to me! A. Here they are . . . he gives them. Q. What does the sign signify? A. That I would rather have my heart pierced than reveal the secrets confided to me. Q. What do the sacred and pass words signify? A. They contain a mystical sense touching upon earthly paradise. Q. What is the hour? A. Midnight has sounded, Worshipful Master. After this answer the Master gives six knocks as before with his mallet on the altar, which serve as a signal to all brethren to rise and to stand to order. The Wardens repeat them in turn with their mallets. The Master says to them: My brethren, announce to your columns that I am going to close this lodge of Fellowcraft Practical Masons. After this is announced to the two columns as ordered, the Master says to the whole assembly: My brethren, this lodge of Fellowcraft Practical Masons is closed. Let us do our duty. The Wardens, having announced in turn the same thing, all give the sign, then six quick claps as before with their hands, saying three times ‘Vivat’. When this is done they embrace each other and then the alms-box for the poor is circulated. After the usual banquet each retires in peace. There is very little in the preparation of the lodge room, regalia or the general working of the ritual or rubric which has a parallel to any Masonic Orders currently practised within mainstream Freemasonry of which I am aware. Indeed I have found no references to a degree series under this title, or a similar title, in the standard texts, and inquiries made of Masonic scholars involved in ritual development have also drawn a blank. It is possible that this is a ritual series that did not survive either as an individual degree or as part of a formalised rite. The background to the acquisition of the Clifford Collection by the NLA, and details of its composition, can be found at page 157 in Burmester, CA: National Library of Australia: guide to collections, vol 1, NLA, Canberra. 1975. For the latest version of the paper on the three degrees, see Morse, N W: ‘Cayers Maçonique’ in Examining Masonry, volume XI (1997) of the Transactions of the Victorian Lodge of Research No 218 VC, available from Bro G C Love, PO Box 2380, North Ringwood, Victoria 3134, Australia. Some discussion regarding these volumes can be found in (1998) AQC 111: 41–2. I am indebted to Bro Gerry Prinsen of the Netherlands for this information. I would suggest, without any definite evidence, that this address was the ‘etimologie’ which precedes the ritual in the volume, and have thus placed it here.